The television review system in the NFL was supposed to settle any questionable and potentially game-deciding plays and ensure the ruling made by the officials on the field was indeed correct. However, there are times when a play is so questionable, that not even countless slow motion replays from multiple angles can decipher whether a knee was down or whether a receiver had fumbled the ball. 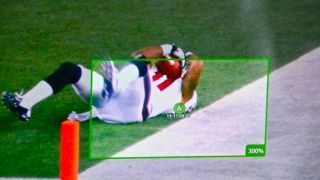 US television network CBS, which is in charge of broadcasting the Super Bowl to a worldwide audience on Sunday, is making sure the officials have the best tech possible at their disposable when reviewing these plays. The network is employing six 4K cameras - provided by Japanese company For-A - which will be positioned around the Superdome in New Orleans when the 49ers and the Ravens lock horns. The cameras won't be used to broadcast the game live, as next-to-no-one has 4K (or SuperHD, whatever your preferred parlance) TVs yet. However, the footage they render will be summoned into action whenever the ref announces that "the previous play is under review" during the game. Of course, the improved resolution, which offers 4x as many pixels as a regular HD picture, will help the refs get a clearer look at the incident in question. However, these cameras also shoot footage at 500 frames per second, meaning the action can be slowed down significantly more than when using regular broadcast cameras. Beyond that CBS is also using software from Canadian company Evertz, which is called DreamCatcher. Once a frame is isolated, DreamCatcher will enable the production crew - responsible for getting the footage to the refs on the field - can zoom in, isolate different points in the frame and switch between them. This is important, for instance, if the refs are trying to determine whether a player's knee is down before the ball is wrenched from his grip. For those uninitiated in the weird and wonderful world of the NFL rulebook, if a player's knee is down when he loses control of the ball, it is not considered a fumble and that team keeps possession of the ball. If its out before the knee hits the floor? Then whoever comes up with the ball has possession. So it seems that although 4K isn't quite ready to take over the way we watch sport on TV, it may have a hand in deciding one of the world's most famous sporting events this weekend. For a little more explanation from the guys at CBS, check out the source link. It's a good read.